The tennis season for 2013 gave us many memorable matches. There were big stage performances by top players including Rafa Nadal and Novak Djokovic, who were the two most dominant players this year. Between them they shared 3 of the 4 Grand Slams, 8 of the 9 Masters 1000 titles and the WTF trophy. However the biggest performance of the year for various reasons was undoubtedly Andy Murray’s Wimbledon final performance. When Wimbledon 2013 started, Nadal and Djokovic looked the two top players in the world. While Djokovic had dominated the first quarter of the year, with a victory at Australian Open and an undefeated run till March 2013. He capped it by beating Nadal in the final of the Monte Carlo Masters. Thereafter Nadal went on a familiar winning spree on the clay courts of Europe, culminating in a record 8th title at the French Open. On the way, Nadal and Djokovic contested an epic match at the French Open, which saw many twists and turns before Nadal final triumphing 9-7 in the 5th set. All this meant both these looked like the top contenders for Wimbledon 2013. However, Wimbledon 2013 shocked everyone in its very 1st week with multiple upsets and injuries. Nadal lost in the 1st round of a Slam for the first time in his career, while the 7 time champion Federer also got knocked out in the 2nd round. The Wimbledon finals on men’s side pitted Andy Murray against Novak Djokovic. Novak Djokovic looked in red hot form and even said he was playing better than in 2011 when he won his 1st Wimbledon title. 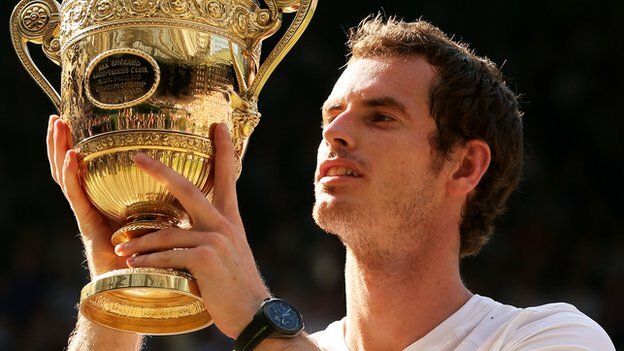 There was immense pressure on Murray to become the first British male champion at Wimbledon since Fred Perry in 1936. However, he responded by playing amazing tennis and won the first set quite comfortably. The way he dominated Djokovic with his serve and forehand pleased the British crowd no end. Djokovic had break in both the 2nd and 3rd sets but allowed Murray to break back immediately and take charge of the match. Murray looked the faster of the two throughout the match, and hit stunning winners from all corners of the court. He also played the clutch points very well and responded better to pressure than Djokovic, who seemingly had no answers for the Murray onslaught. The pressure of winning must have been huge on Andy Murray, but for the 1st time at Wimbledon, he rose under the pressure, rather than wilting under it. Murray finally clinched the match 6-4, 7-5, 6-4 after a nerve wracking final game which had multiple twists and turns. And immediately afterwards he looked in shock and disbelief as he ended a 77 year wait for the British people for a home grown champion at Wimbledon. For handling the immense pressure and displaying a top level of tennis that even subdued a great champion like Djokovic, this Wimbledon victory has to rank as the performance of the year.